On 6 July 2017, Nobel Brothers Shipyard launched the second vessel in a series of two oil barges of Project ROB07 for JSC Lena United River Shipping Company, the shipyard’s press release said. The Project ROB07 satisfies the dimensions of Lena basin waterway and the Volga-Don, Volga-Baltic channels. General characteristics: overall length - 95.23 m, overall breadth - 16.8 m, depth - 5.0 m, 3.50/3.60 m draft deadweight – 4,244/4,403 tons. Capacity of twelve cargo tanks and two slop tanks - 4670 m to carry two types of liquid bulk cargo. Diesel generator rated power - 350 kW, of harbor generator - 6.4 kW. Pump performance - 5 x 150 m3. RS class notation - КE R3-RSN Oil tanker (ESP). Nobel Brothers Shipyard LLC based in Rybinsk of Russia was founded in 1907. Today, this is the largest shipbuilding firm in the Upper Volga: the yard encompasses 214,000 sq. km, the company's workforce is 500 employees. 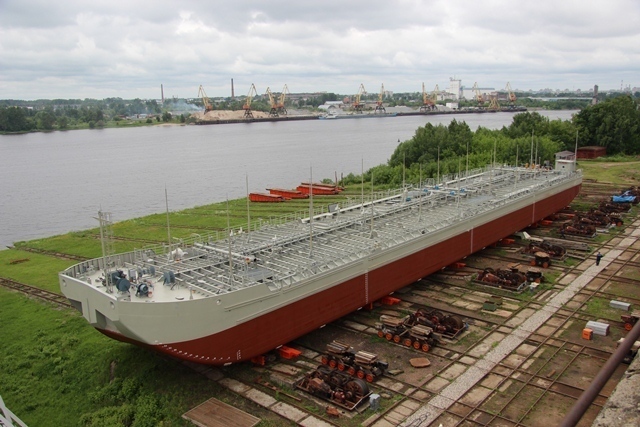 The shipyard specializes in the construction, maintenance, repair and refitting of sea-going and river multipurpose vessels with 6500DWT, a length of 140 m, beam of 17 m and launching weight of 2700 tonnes. The range includes dry bulk carriers, tankers, barges, container ships, timber carriers, diving support and hydrographic vessels, harbour vessels, workboats, oil boom-laying boats; hulls of various types and modern comfortable yachts.